Hand-Picked . Personalized . Delivered . or... get a gift card! 3 months of summer fun delivered right to your door! This special subscription includes 3-4 books each month that are perfectly personalized to the child's unique age, interests & reading level, plus activities and a special item - like a journal, exclusive stickers and more! Inspire a lifelong love of reading through the summer months. Read aloud from birth to foster a positive parent-child bond. Read aloud and play, learn & explore new topics together. Read aloud or read alone. Perfect picks help inspire new readers. Read alone. Explore new genres and expand minds & imaginations. "The amount of thought and effort that went into putting this box together was incredible! By adding her interests and reading level, they picked a perfect variety of books for her!" "My 7 y/o is excited to open his box for the books & special small gifts. He has received chapter books, interesting boys stories, biographies, and history books. His interest in reading has rocketed! This is the best investment. " "My little girl is 8 yrs old and hates to read. But already I'm seeing a change... she can't wait for the next box! I like that the books are chosen especially for her. It makes it easier to get her into it. 2 thumbs up!" "Great selections! This last box was perfect! Lauren did an amazing job putting the box together, and now my son has us reading the books to him every night. Thank You!!" "I got this for my almost 12 yr old daughter who is a huge reader... and it was a HUGE hit! She received 3 books and loved them all, and she also loved the goodies that came in the box. She can't wait for the next box to come! Highly recommended." The very best books and extras, expertly chosen and personalized by The Reading Bug. Selected by the expert staff of The Reading Bug & matched to your child's age, interests and reading level. Matched to the theme of the Box to make reading fun & engaging. From The Reading Bug! Checking in on progress & filled with tips for follow-up reading & activities. Every book in your Reading Bug Box is selected by the expert booksellers at The Reading Bug, our family-owned, independent children's bookstore. As booksellers, we eat, breathe and sleep children’s literature! We see how children respond to books we read aloud every day at storytime. We meet authors and work with local schools to find books that resonate at every age and reading level. We speak with the children and parents who come into our store, and we delight in matching the perfect book to every child. So, what books will be included in my Reading Bug Box, anyway? Books for each Reading Bug Box are selected by the expert booksellers at The Reading Bug, our independent children's bookstore. As booksellers, we eat, sleep and breathe children's literature, and our selections reflect our experience reading books at storytime, working with local schools and talking with the children and parents who shop with us every day. Personalized subscriptions include books that are hand-selected by a member of our store staff and perfectly matched to the recipient, based on the specified age and interest of each child. 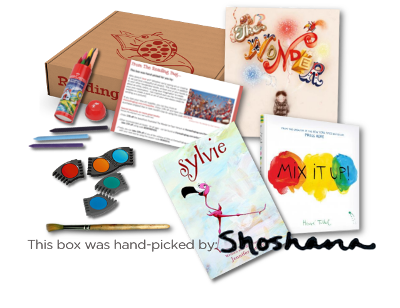 We are confident each Reading Bug Box is packed with love, attention to detail, and the very best books we can find. But why shouldn't I just shop with a big online retailer, instead? We'll pretend we didn't just hear that! Like I said, we're book experts. It's our job to know how to match the best books to every young reader, regardless of their age, interests or reading level. We make avid readers out of reluctant ones with our book choices - and we introduce voracious readers to new interests and adventures! That's our job - and we love it, and are passionate about it. Reading Bug Box grows with your child as they improve their reading skills and expand their interests. Great! And what if I want to send to two readers at the same address? Is there an option for that? We've got you covered. You can add a child to any personalized subscription and save 15% plus the extra shipping. More than 2 children, and you'll need to purchase multiple subscriptions, however. OK! This is sounding perfect, but what if you send me a book I already have? And what if I need to skip a month or cancel? No problem! Just log into your account and skip the next month's renewal - or cancel any time with a month-to-month subscription. It's really easy, I promise. I can't wait! When will my Reading Bug Box ship? All boxes ship between the 10th & 20th of the month. Orders placed after the 20th will ship the following month. Need it sooner? No problem! Email us and we'll do our very best to accommodate! Your card will be charged on the first day you subscribe. You will be rebilled on the last day of each subsequent month. Boxes ship between the 15th and 20th of each month, and any order placed before the 20th will ship its first box in the current month. How can I change my reader's preferences? You can update your reader's preferences or send us more information to help our team of experts personalize your Reading Bug Box any time! Log into your account at readingbugbox.com/customer/account and use the "Edit" button next to your subscription to make changes. Does Reading Bug Box have a referral or affiliate program? More questions? We've got more answers on our FAQ page. An original stories & music podcast for children of all ages! Let's fly! Every episode is a new adventure, so hop into the Reading Bug's magic book bag with us and explore new books, new concepts and new worlds. Don't forget to bring your crayons and paper along so you can color your own illustrations, too.